Unfriended: Dark Web is the new installment in this franchise that is put out by Blumhouse Studios. 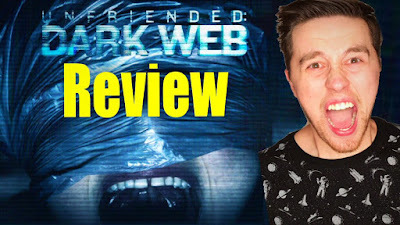 Now the first Unfriended had me intrigued i’m a sucker for found footage films and the fact that it only takes place on a computer screen is intriguing to me. It’s something that we rarely see in film and the first one had some good concepts, but the ending kinda ruined it for me and just fell once again into a generic horror thriller type of film. Now with this one they get rid of the paranormal stuff and move on right ahead to the Dark Web which if you don’t know what the Dark Web is… GOOD. It’s a scary place on the internet. So with this new issue in this film and dealing with the internet and these young adults having to deal with this issue as well it had me intrigued once again. The first half of this film had me so on board where I couldn’t wait to see where it went, but once a certain event occurs by the third act it just goes all way downhill from there. The film and its premise once again were not executed again and falls literally into the same type of ending of the first one. Just generic and predictable. Not as cheesy as the first, but I became so frustrated by this I kept checking my watch and wondering how much longer this film would last. Again I enjoyed the first half and was so on board I just wish the film went in a different direction. The whole cast does a great job well and none of it is their fault, most of my issues fall into the script. Maybe another draft of that script would of helped. I do also want to address that there are supposedly two endings to the film in theaters, maybe I just got the crap ending and the other one is mindblowing better, but I doubt it is a dramatic change and at the time of writing this review I still do not know what the other ending is even after talking to others and looking it up..maybe it got lost in the DARK WEB like the third act of this film should of been. If they make another one of these films I hope they can find their strive in the back half, but for now it just will become forgettable once again. For more views on the film check out my video review down below.